We don't know what it is, but the mere sight of a mortarboard can cause us to spontaneously well up with tears. And don't even get us started on Pomp and Circumstance. We're a lost cause. Needless to say, we are suckers for celebrating graduations. Graduations of all kinds — preschool, kindergarten, elementary school, well, you get the idea. When it comes time to throw your next graduation party, whether for your preschooler heading off to elementary school or your high school senior heading off to college, bake a batch of graduation cupcakes and make them unique by creating special, one-of-a-kind mortarboard caps made of easy to find ingredients. To make them even more special, why not decorate with fruit roll-ups in the colors of your graduate's school? Make sure you frost the cupcakes with white frosting. A cream cheese frosting or buttercream frosting are good choices. Peel the miniature peanut butter cups and turn them upside down (so the wide part is facing down). Place a dab of black gel frosting in the center of the upside down peanut butter cup. Attach a thin mint, pressing firmly so the mint adheres to the peanut butter cup. The tassels for your graduation caps will be made out of the fruit roll-ups. It's a nice touch if you can find fruit roll-ups in the colors of your graduate's school, but don't worry if you can't. 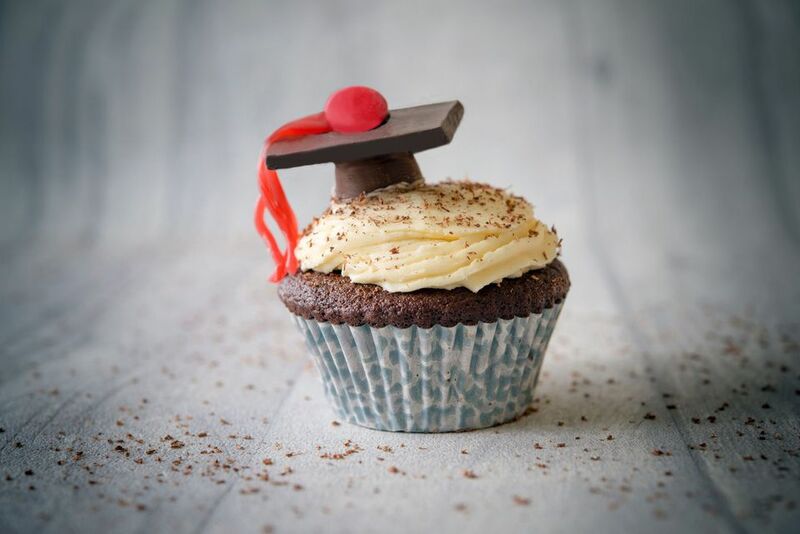 These graduation cupcakes look great with just about any color tassel. With clean kitchen shears, cut the fruit roll-ups into half-inch rectangles. You will need half as many rectangles as you have cupcakes. So if you have 18 cupcakes, you will need nine rectangles. Now cut four thin strips to resemble tassel fringes out of each rectangle. Next, cut the fringed rectangles in half lengthwise all the way through to the top. You are making two tassels out of each rectangle. So you will now have 18 tassels if you started with nine fruit roll-up rectangles. Squeeze a dab of black gel icing on top of the thin mints, and attach an M&M candy to it. Next, squeeze a short line of black gel icing next to the M&M, and attach the fruit roll-up tassel to it, pressing gently to make sure it adheres. Let the icing on your graduation caps dry for a few seconds before attaching the tassels to the cupcakes. It's almost time to serve your graduation cupcakes! Once the caps from Step 5 are completed and dry (you only have to wait a few seconds), you're ready to attach them to the cupcakes. First, make sure you have plenty of icing on your cupcakes. This is the "glue" that will hold the candy mortar boards you just made to the graduation cupcakes. Now, press the candy graduation caps gently into the frosting of the cupcakes, making sure the caps are stable before moving. Now you can transfer your graduation cupcakes to a tray or cake plate. Cover with a cake cover or transfer to the refrigerator until ready to serve.